The Pakistan Air Force (PAF) and Pakistan Aeronautical Complex (PAC) are renewing their efforts to secure additional customers for the JF-17 Thunder lightweight multi-role fighter, which is co-produced by the Aviation Industry Corporation of China (AVIC) and PAC, and is the mainstay combat aircraft of the PAF. These efforts follow deliveries of the JF-17 to Myanmar, which had reportedly ordered 16 aircraft in 2015, and Pakistan’s Economic Coordination Committee (ECC) greenlighting a $184 million sale of three aircraft to Nigeria in late 2018 (Nigeria earmarked a $35 million installment for the order in its 2018 budget). Currently, Malaysia and Azerbaijan appear to be the PAF and PAC’s top priorities for securing sales – both countries are high-value prospects. 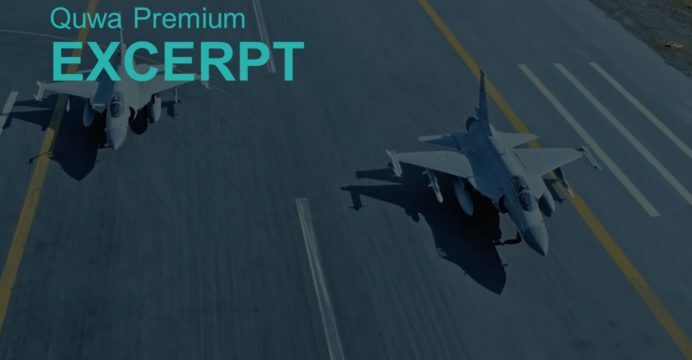 With at least 100 JF-17s inducted into the PAF fleet and, following the February 2019 air skirmish with India, the PAF seemingly accrediting the MiG-21bis kill to the Thunder (via Air Forces Monthly), a big-ticket sale to a third-party would drive significant momentum. On March 22, the Pakistani Minister of Finance, Asad Umar, reportedly told local media that Malaysia had shown interest in purchasing the JF-17 alongside anti-tank missiles from Pakistan. Invited as a guest of honour at the Pakistan Day Parade, the Malaysian Prime Minister Mahathir Mohamed was given a briefing of the JF-17. However, reports of PAC’s speaking with Malaysia about the JF-17 stem as early as 2015, when reports initially emerged of Islamabad proposing the fighter to Kuala Lumpur. The Malaysian Minister of Defence at the time, Datuk Seri Hishammuddin Tun Hussein, had denied of any such dealings. In 2016 and 2017, it had seemed that the Royal Malaysian Air Force (RMAF) would procure a Western European fighter, especially as Saab and BAE had reportedly been willing to extend loans/lines-of-credit to back the Gripen and Typhoon, respectively. Malaysia has largely favoured Western systems. However, at the 2018 Defence Services Asia (DSA) exhibition in Kuala Lumpur, PAC told IHS Jane’s that it and the Malaysian side were in “primary level talks” regarding the JF-17. This round comes following the RMAF opting to procure lightweight fighters to augment its fleet and, potentially, supplant its MiG-29s. PAC had still cautioned that these were not ‘serious’ talks, but the Malaysian Prime Minister’s recent visit to Pakistan may have potentially pushed the matter to a more substantive level. Rarely do marquee defence purchases, such as those of combat aircraft, separate the technical merits of the acquisition from its foreign relations realities. Malaysia’s current fiscal constraints notwithstanding, it is unrealistic to expect Pakistan to win-out against better backed competitors. However, when it comes to a JF-17 proposal, Pakistan is not the only factor – there is China as well. Thus, a potential sale in a market as significant as Malaysia will likely see PAC leverage AVIC’s support (including offset, financial, and transfer-of-technology carrots). On the other hand, China itself has only entered the Malaysian defence and security market recently, with its recent watershed sale being four Littoral Mission Ships (LMS) to the Royal Malaysian Navy. Though the LMS has a scope for up to 18 ships, there is no guarantee that the Chinese LMS program will mature to that extent. Thus, a JF-17 sale in Malaysia will likely be an uphill battle for AVIC and PAC, but the Thunder is not without its own competitive strengths in terms of cost and readily available versatility.